R to L (Japanese Style). Red doesn't just want to train Pok?mon, he wants to be their friend too. 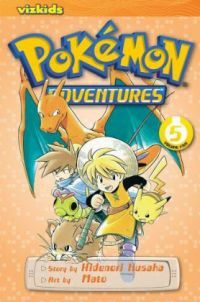 Read along as Red embarks on adventures with Pikachu, Bulbasaur and others that follow storylines from the videogames! Pok?mon trainer Red has vanished... Trainer Yellow Caballero and Red's faithful Pikachu are off to rescue him. But it will take smarts, skills, and a lot of help from friends and other Pok?mon to find and rescue Red! And watch out for the Elite Four, Yellow Caballero... Are you a strong enough Pok?mon trainer to defeat all of them?